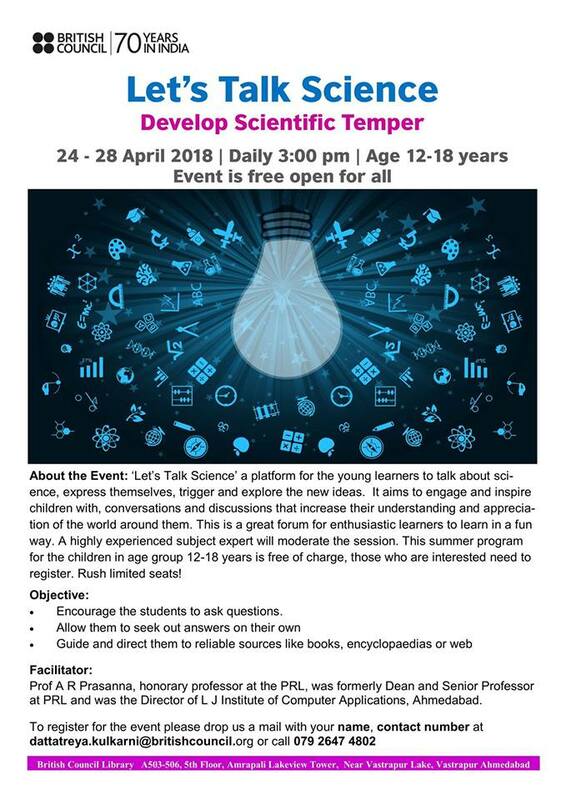 About the Event: ‘Let’s Talk Science’ a platform for the young learners to talk about science, express themselves, trigger and explore the new ideas. It aims to engage and inspire children with, conversations and discussions that increase their understanding and appreciation of the world around them. This is a great forum for enthusiastic learners to learn in a fun way. A highly experienced subject expert will moderate the session. This summer program for the children in age group 12-18 years is free of charge, those who are interested need to register. Rush limited seats! • Encourage the students to ask questions. • Guide and direct them to reliable sources of reference like books, encyclopaedias or web to read more. Prof A R Prasanna, honorary professor at the PRL, was formerly Dean and Senior Professor at PRL and was the Director of L J Institute of Computer Applications, Ahmedabad. He obtained his PhD degree in Applied Mathematics from the University of Pune.